The Grand Opera House is a whirlwind of activity at the minute, as the young cast of ‘The Wizard of Oz’ begin rehearsals for their upcoming show. 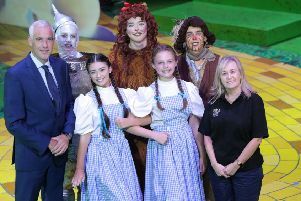 Hundreds of budding young performers from all over Northern Ireland will be coming together for this year’s summer project to follow Dorothy and her friends on their musical journey to meet the great and powerful Wizard of Oz. Peter will be joined on stage by two girls who are sharing the role of Dorothy - Holly, from Newtownabbey and Caroline from Jordanstown. This is the first time that Holly, a student at Belfast High School, will take on a lead role, although she has been involved with the summer project in previous years. Admitting to having a few nerves about opening night, Holly is delighted to be playing the role of Dorothy. “This is the first time I have got a principal role and it is always something I wanted,” she said. “There is a lot of talent on stage and so much competition so I wasn’t really expecting it, and when I found out I was so excited to tell everyone and see their reaction. “Dorothy is a strong character but feminine too. 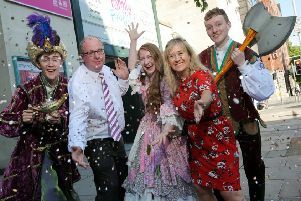 Tickets for The Wizard of Oz are on sale now from the Grand Opera House Box Office and online at www.goh.co.uk.